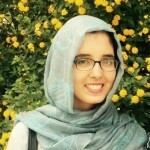 She is a Pakistani woman who has been ‘shot, electrocuted, and beaten numerous times for her activism’. I love brick houses; specifically the feel of those rectangular blocks. But when I know the hands that made those bricks were of a 12-year-old who couldn’t afford a decent meal in the morning, I don’t want to even see one let alone live in one. I cannot hold a passion for those houses anymore. Bonded labour is a shameful reality in Pakistan, which many are unaware of, as we celebrated our so called independence last week. So my question is, are we really free? Without sounding metaphoric, there are helpless people in our country who have been condemned to lifelong labour without or with less than sufficient wages. 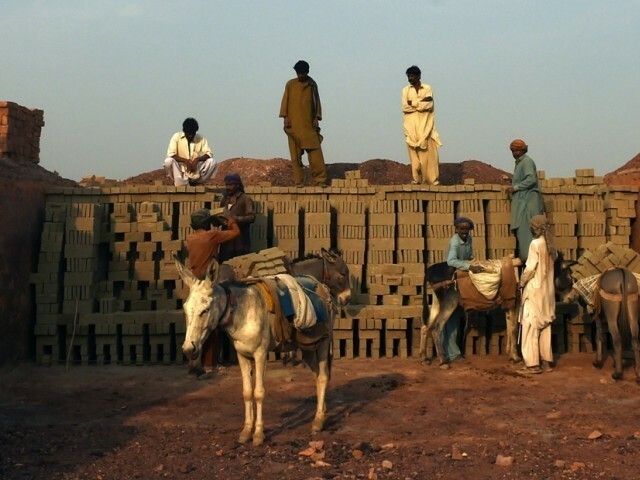 Brick kilns are being ruled by the rich and powerful through exploitation of our fellow men’s destitution. The owners lend them money in exchange for labour, which has been seen to bind generations upon generations. The severity of this situation was made clear to me, an average Pakistani, through the American photographer and journalist Brandon Stanton of Humans of New York. On his tour of Pakistan, he shed light upon the story of Syeda Ghulam Fatima who has been working tirelessly for this cause. 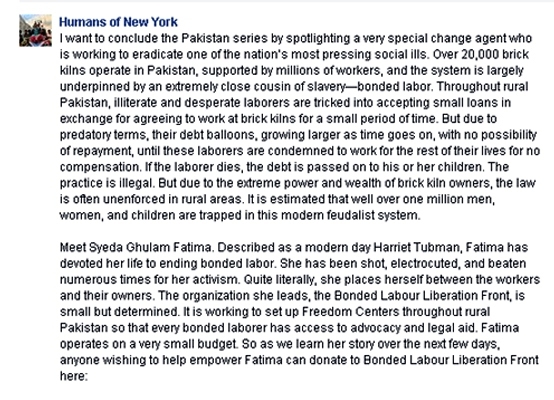 She is a Pakistani woman who has been ‘shot, electrocuted, and beaten numerous times for her activism’. She is a Pakistani who is fighting our war alone. According to her, the local police are aware of this folly, but silent due to the brick kiln owners’ generosity with money. She runs an organisation called the ‘Bonded Labour Liberation Front’. Stanton started a fund raiser for this organisation, and currently an estimate of 1$1.3 million has been collected for a goal of $100,000. Anyone is welcome to donate if they wish to. While people are thrilled at this substantial amount of donations from all over the world, I can’t get myself to feel content, simply due to the role of our government in this matter. How can the authorities turn the blind eye towards such a critical issue? 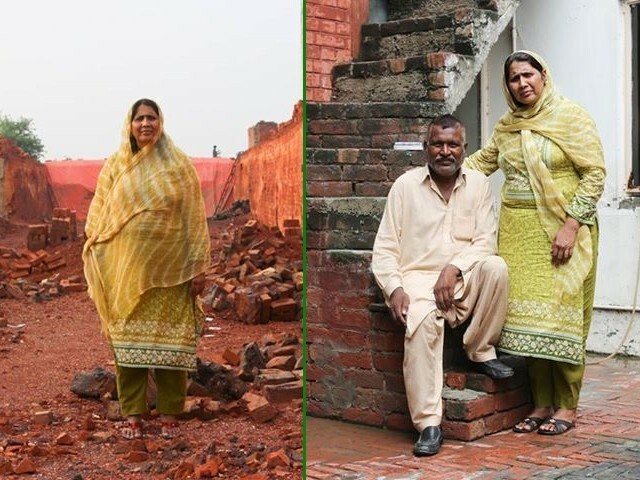 Thousands of brick kilns are operating all over Pakistan and the bonded labour system is openly practiced despite the Bonded Labour System (Abolition) Act, 1992. Imprisonment or heavy fine was supposed to be the punishment if one fails to abide by this law. But such culprits continue to walk on this land free and proud. Another similar case revealed a story of a man who fell prey to the feudal system, and has been since the age of 12. He was beaten for holding meetings with other workers regarding their demands for fair wages. When he managed to escape, the owners broke into his house with the help of the police and paraded his daughters naked on the streets. I admit that raising funds to donate to this cause is extremely important. However, it is not more important than bringing this matter in notice of our leaders. Mr Nawaz Sharif needs to take the plight of his countrymen into account; he can put the road structures of Lahore on hold for now, as such matters need his urgent attention. This is nothing short of slavery and I for one can no longer be a proud Pakistani, for as long this catastrophe remains in this land. This issue hasn’t received the attention that it deserves, nor have people like Fatima who are facing the brunt of such brutalities. She deserves recognition. She deserves that appreciate her. Why should one woman walk alone, especially since we live in a democratic nation? So I’m putting our federal government’s claim to the test. Mr Prime Minister, you have a duty towards your people; don’t make them fight the battles they shouldn’t need to fight at all. Clearly, Pakistan is not a free nation yet. Noor. I am really happy to see you writing so brilliantly for such a cause. It is true and very unfortunate to play the game of words for the poorest classes in this country. We are in a state of denial sometimes. We tend to believe that everything is alright and happily continuing just because we are the people who belong to a class who owns something, who doesn’t need to bother about matters like bonded labor, child abuse, oppression etc. This is a deception to the very body of this nation. May Allah give us the strength and valor to help people and talk about them and their humanistic work. And do something really really valuable for the well being of these peoples. Excellent blog. Great piece of writing. Could not agree more with the author. Unfortunately, the Sharifs are extremely busy.